St. Jerome’s University, the faculties of Arts, Mathematics, and Science at UW and the Fields Institute were proud to present the first lecture in the 2016-2017 Bridges lecture series, “Pattern finding — popular expression of transcendent ideas” on Oct. 27. 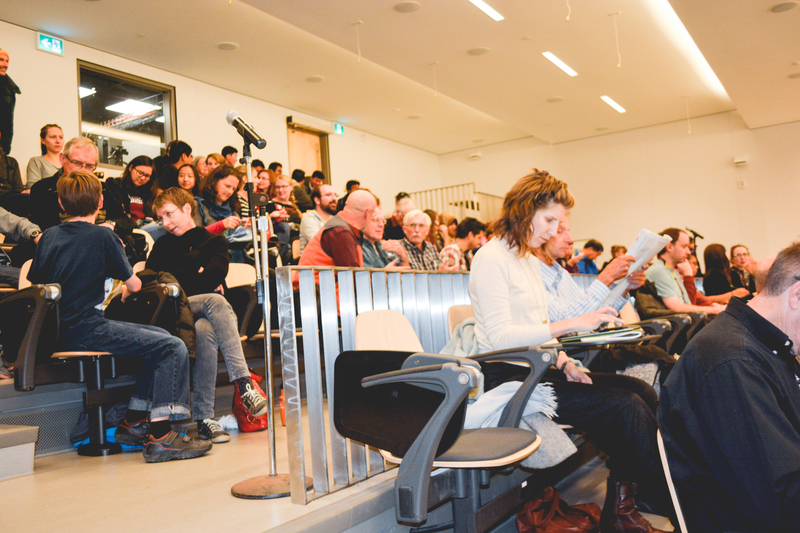 The two speakers were Soheila Esfahani — award-winning Waterloo-based artist and UW lecturer, and Dr. Matthew Scott — associate professor of applied mathematics and co-director of UW’s mathematical biology laboratory. The hosts for the event were Paul Craig, Benoit Charbonneau, and Alysia Kolentsis. 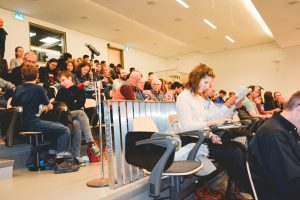 The goal of these lectures is “to challenge those boundaries among the disciplines, and to recognize that some of the best ideas are those that are informed from a variety of perspectives” said Kolentsis. The series has expanded this year, adding the science faculty. The lecture also included an art exhibit bridging art, science, and math through pattern. It featured six UW students and one UW alumni: Jan Fretz, Yasmeen Nematt, Raegan Little, Margaret Gissing, Neda Moshg, Ioana Dragomir, and Hannah Veiga. The pattern finding lecture’s premise is “to consider how mathematics can help to shine a light on the processes of aesthetic perception and response” said Kolentsis. Esfahani focused on geometry and patterning in Islamic culture, looking at three different forms: tile works, arabesque, and calligraphy. She also showed how patterning is used in modern Islamic art with the works of Zara Houssein, Monir Shahroudy Farmanfarmaian, Laurent Mareschal, and an unnamed Canadian artist working with photos to create Islamic patterning. Esfahani’s talk centered around the idea that geometry “become a sense of mediation so they sort of become a passage for other things, become a magnet for other ideas, and that is what lets the viewer to wonder and start associating various things with this kind of geometry.” This explanation showed the more artistic potential of geometry. Scott focused his portion of the lecture around the idea of epiphany in mathematics and religion. He explored how math can be beautiful, using the Pythagorean theorem as an example. Scott talked about the Japanese devotional folk mathematics that occurred during the Edo period in the form of Sengaku. They were traditional Japanese temple geometry problems on wooden tablets hung in temples and shrines that were carved or painted to look beautiful. “They would have geometric shapes along the top, and then some description of the figure and some mathematical results,” explained Scott. There was no prejudice in the hangings; writers included children, men, women, rich, poor, teachers, fishermen, carpenters, and more. Scott walked through one problem’s solution, then gave the audience some questions from the Sengaku to solve on their own to achieve personal epiphany from solving them.